Jeep and Mopar have made a highly-anticipated tradition of revealing a number of drool-worthy concept vehicles at the annual Easter Jeep Safari in Moab, Utah, and 2013 has not disappointed; it's clear that Jeep and Mopar listen to their fans. The best thing about these concepts is that they aren't just pretty faces; they're built and driven to get dirty. I wrote about last year's concept vehicles here, and while we didn't get anything this year like the over-the-top Mighty FC, we did get six new vehicles. 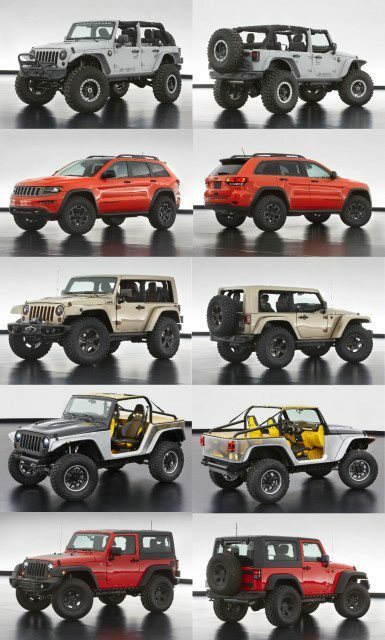 Five of them are based on the Jeep Wrangler JK, and one is an upfitted EcoDiesel Grand Cherokee Trailhawk II. For an overview of the six new vehicles, head over to Expedition Portal and Jeep's own blog. The Jeep Wrangler Flattop's most obvious new idea is its modified hardtop. By cutting down the hardtop to match a 2-inch-shorter windshield and removing the B-pillars for wide-open sides, the Wrangler gets a unique look. A mild suspension lift kit combined with a (perhaps soon to be available) fender lift kit allow enough room for 37-inch tires while retaining a low center of gravity. Expedition Portal has published some terrific photos and more information on the Flattop. The Mopar Jeep Wrangler Recon is a military-themed 4-door JK Wrangler with Dynatrac Dana 60 axles, 37-inch BFGoodrich Krawler tires, and a 6.4-liter 392 HEMI. Expedition Portal has more info and photos. We already saw the Sand Trooper at the 2012 SEMA show with Mopar's launch of a hugely expanded line of Jeep upgrade parts, and the vehicle has returned with a few updates. Its two biggest features are its Mopar Portal Axles and its 5.7-liter HEMI. The Wrangler Slim is Jeep's take on a mildly-modified, "average Joe" trail Jeep. It's fully accessorized by Mopar, including a 2-inch suspension lift, upgraded bumpers, wheels, and tires, and typical add-on accessories such as a CB radio and slush mats. Their intent was to build an offroad-ready Wrangler while keeping the weight down, in contrast to the numerous overweight Jeeps we've been seeing lately. The EcoDiesel Grand Cherokee Trailhawk II is an SUV done right. It may not have the solid axles and open top that are the core of Jeep's brand identity and enthusiasts' respect, but Jeep's engineers have done as much as they can within the limitations of independent suspension. To fit 35-inch Mickey Thompson Baja MTZ tires on Wrangler Rubicon wheels, engineers had to remove the air springs and fit standard coil springs to allow the Trailhawk's suspension to ride at its maximum permissible height. Cutting away sheetmetal opened up the wheelwells enough to fit the tires, while making for a stable, low center of gravity. Some trim pieces from the SRT-8 Grand Cherokee along with rock rails and skidplating help distinguish the Trailhawk II from any other Grand Cherokee. Although I am still bitter about the Grand Cherokee's loss of its proper pair of solid axles (as found in the 1993-1998 ZJ and 1999-2004 WJ), at least this new WK2 is available with a locking rear differential to make up for some of the lost ground resulting from its "advanced" suspension's limited wheel travel and nearly impossible ability to be upgraded. This setup is obviously not very capable in rocky terrain, but the IFS and IRS are suitable for backroad exploration no matter how nasty the mud or snow may be; the EcoDiesel engine oozes gobs of torque and is ideal for long-distance expeditions. This pictures are great for showcasing the incredible designs for Jeeps. I like most the Mopar Jeep Wrangler Recon a military themed 4 door JK Wrangler makes awesome ride for me. Nice showcase.